BMW's not talking much about the Vision Connected Drive roadster as a viable vehicle, only that its interior design employs an intriguing design concept using "layers" of materials and information to better compartmentalize a driver's duties. Fancy stuff! But what does it all mean? Are they gonna build it? Sorry, no talkee. The focus is on a new set of technologies BMW calls ConnectedDrive. The system uses algorithms to add value to a driver's own devices, filling in the blanks between his calendar and his transportation needs. What does that mean? For example: Let's say you've got a date with, oh, I don't know, Katy Perry (also imagine Russell Brand is off filming Arthur or something). The system will analyze where you need to meet Ms. Perry — and when you need to get there — and calculate the most efficient route, considering tolls, traffic and other parameters, and even find you a parking spot near Medieval Times. Then, after the show's over, Ms. Perry can use her passenger-side info device to look into a private detective agency's hours so she can initiate a background check on you, and/or look into a restraining order. That, and to find some really good Thai food for delivery after you drop her off, which she buys with her AMEX Centurion card. 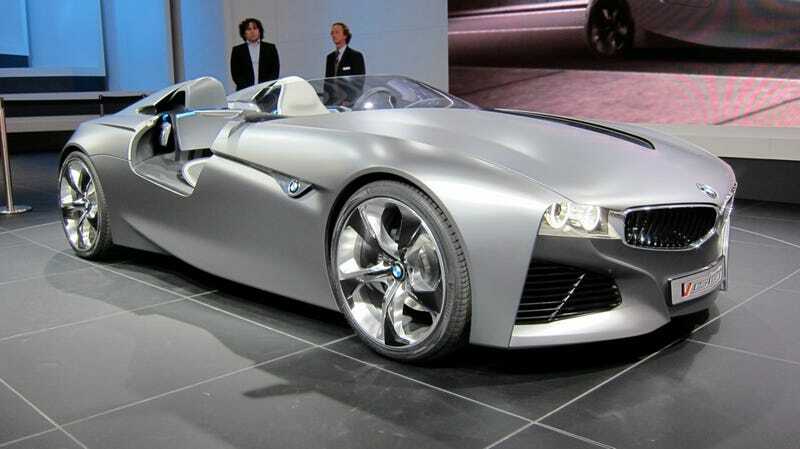 Of course, you're so pissed off that she's rejected your advances that you don't see that another BMW Vision ConnectedDrive roadster has stopped short in your lane. But, lo, the car does a pirouette around it and lands three streets away. Ok, it can't do that, but it does have some kind of car-to-car communication system that'll let cars communicate with each other for safety. And that, my friends, is BMW's vision for a connected future.